I was thinking about “issues” I have that might be addressed in a painting, realizing that my biggest issue always boils down to “me”. I’m the issue. The mere fact that I chose to be an artist is something I ponder, but that is long story for another time. 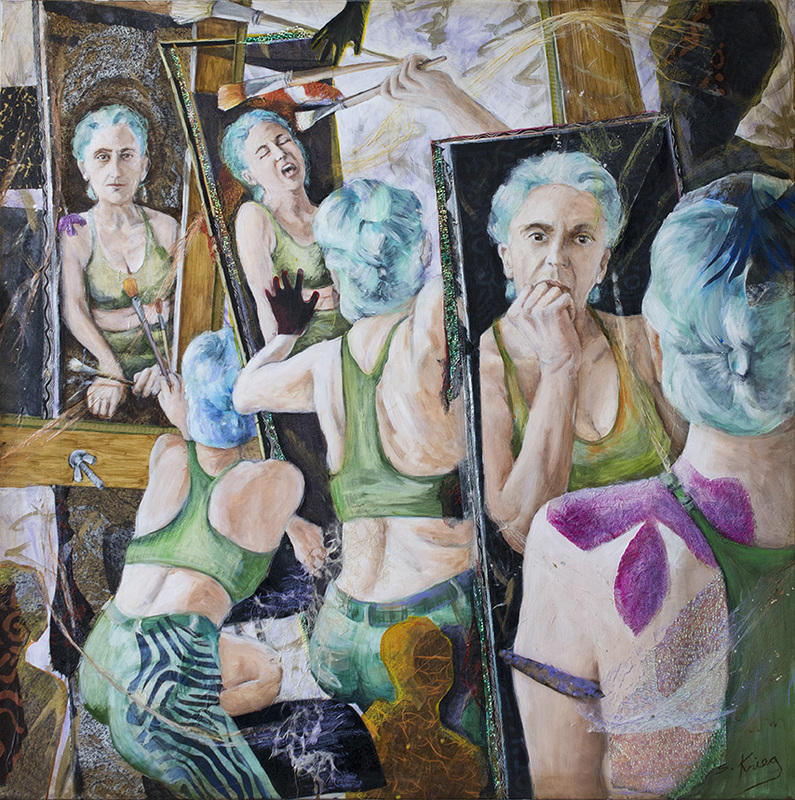 A multi-figured self-portrait of Susan Krieg. Mixed media on stretched canvas 30″ x 30″. I asked Robert (my husband) to take a couple photographs of me at my easel. I posed with brush in hand and freely moved into postures that came naturally. My focus wasn’t on the mirror that I keep behind my easel. My initial intent was to use the back of me in the process of painting as reference material and to create a painting of someone (not me) in the process of creating art. When I uploaded the images I realized that this huge range of emotion embodied my process of painting, thus the outcome was a multi-figured self-portrait of me facing my issues as an aging artist, aka A Work In Progress. Here’s the good part. I painted this portrait in August/September 2018. Unbeknownst to me at the time was an upcoming Self Portrait show in the Art League Gallery at the Torpedo Factory. For the mere torture of being rejected again and the tiny glimmer of hope for acceptance I entered the painting and it was accepted – a welcomed happy surprise. The opening reception is Thursday October 11, 2018 at 6:30 at the Torpedo Factory. If you live in or near Alexandria I hope you’ll come. Absolutely breath taking, my beautiful aunt! Awesome piece and great story. Congrats! !